Can pen an essay on any topic in minutes; prefer reading books over watching a movie, never at a loss for words? If this is you then you have obviously realized that you have a flair for languages. It is a good thing to have recognized one’s strengths early on in one’s career. If you have just completed Class 10, the obvious stream to choose after Class 10 is Arts/Humanities. If you are contemplating taking up Humanities after Class 12, even then it is not too late! In fact, it is never too late to pursue your interest and inherent capabilities and make a successful career out of it. The sooner you take up subjects allied to your interest and aptitude, the earlier the chance and longer the exposure for you to work on honing your skills. Being good at languages is a quite generalized understanding of your strengths. An aptitude test and personality test will help to narrow down your most suitable options. 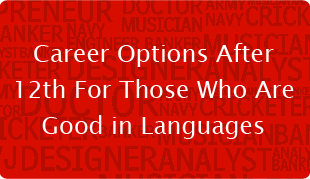 Here are a few career options that a person with interest and aptitude for languages will find appealing. There are several undergraduate / post-graduate / certificate / diploma courses that one can pursue for each of these career options either after 10th or after 12th. These have been mentioned briefly. If you have an interest in foreign languages, then translation is a very lucrative career option. Even while pursuing college after 10th or a degree after 12th, you can learn foreign languages. Institutes like the Alliance Francais (French) and Goethe Institute (German) offer certificate programs level-wise. After completing a certain level, you can become a certified translator. Translation jobs, especially in foreign languages, pay fabulously. Similarly, you can also be an interpreter. An interpreter is required to convert oral speech/es made at conferences / meetings / international forums to a target language. Career options include working for international foreign bodies such as the United Nations, etc. If research is your cup of tea, then you can study linguistics and contribute to the ever evolving field of language study. Within linguistics, there are several branches and you can choose the one you are interested in. All major universities in the country offer post-graduate degrees and/or diploma courses in linguistics. If teaching is to your liking then you can pursue a degree in the language you would like to teach after 12th. After a post-graduation in the subject, you can appear for NET and begin teaching in colleges/universities.If you want you can do B Ed and teach in a school. Similarly, if you complete requisite number of levels from the foreign language institutes mentioned in the previous career option, you can begin teaching at these institutes. The following career options/courses have been mentioned keeping in mind proficiency in languages used widely such as English and Hindi. If you have an outgoing personality and an aptitude for languages, journalism is one of the options you could consider. Journalism - be it print/television/online requires a good news sense and the ability to present the relevance and importance of the event to the viewer/reader. Journalism requires the ability to talk to people and get people talking. Hence, the requirement of an outgoing personality. Television journalism requires a large verbal repertoire while print and online journalism requires a good repository of words. All of which should be easy if you are good at languages. A number of universities across the country offer undergraduate courses in journalism that you can pursue after 12th while there are a number of leading media houses who have started their own journalism institutes offering post-graduate diplomas in journalism. Similar to journalism, public relations requires good writing skills and the ability to interact with a wide variety of people. Public relations professionals have to dish out press releases that appeal to journalists, organize interactions/events and ensure that the company/individual they are working for is adequately covered by the media. All of this becomes easy if the individual has a good command over languages. If working in the corporate world is to your liking, you could consider working for the corporate communications department of companies. All companies have such a department because it is essential in today’s day and time to be in the public eye for the right reasons. The work of a corporate communications is similar to that of a PR agency. However, in a PR agency, an individual gets to handle a multitude of clients while being in the corporate communications of a company you handle all communication-related work only for that one company. In recent times, ensuring that your website is visible and appears among the top few in search results is important in an online space teeming with millions of websites. A number of companies are waking up to this reality and are hiring professionals to ensure that they have content that clicks! To become an online content writer/SEO all you need is internet literacy and extensive use of social media. While you could take up certificate creative writing courses, this kind of writing is more of a learn-on-the job thing. All you need to have is good researching skills and the ability to write information in an interesting manner. If your love for languages is accompanied by love for films/television/theater you could try your hand at script writing. Several universities/film and television institutes/theater institutes offer courses in screen writing / script writing / play writing. Copy writing is usually associated with the advertisement industry where advertisements require smart play of words to appeal to the audience. If you have a way with words, copy writing may just be the thing for you. In case of both script writing and copy writing, you begin as early as after 10th/after 12thto begin writing your own copies / scripts for college/school plays / films / dramas etc so that by the time you have completed your graduation, you have a portfolio ready to showcase. If your love for imagination and writing is as strong as your love of languages then you could consider being an author/writer/novelist. And the best part is that to be an author you need not wait to finish a certain degree/diploma etc. You can just let your imagination run wild (or your research skills if you prefer non-fiction) and begin writing your book anytime. In fact you can even write your book while pursuing another career. Obviously a degree and exposure to other people’s works will have a great impact but there is no start date to when you can begin writing! Can spot a spelling/punctuation/grammatical error easily? Then proofreading is probably the option for you. Similar to content writing you can begin freelance proofreading and editing assignments while pursuing an undergraduate course itself. If you are good proofreading assignments pay well. Speech writing is an unconventional career option that you could consider if you are inclined. You may find place in political parties where it is very important to make the right impression on the public. What with the advent of technology, educational content is now available in various forms and not just books. There are several organisations creating online content/interactive content for schools/coaching institutes etc. If this kind of specialized content creation is to your liking, you could try your hand at it. The key is to ensure that the language is appropriate to the audience you are writing for. If you are good at languages there are several career options and courses to choose from. However, if you are confused, it is best to undergo an aptitude test to understand your strengths. Internships, with organisations working in the field of your interest, either after 10th or after 12th will also help consolidate your choices.